Can Print Media Keep up with Technology? > Can Print Media Keep up with Technology? Bob Dylan said it right: the times, they are a-changing. Every day we’re treated to a new advancement in technology, and it seems there’s no area of life that can’t be improved by the application of a little tech. As far as online marketing goes, if you’ve got an ecommerce site, banner ads and emails may seem like the most obvious answer to advertising. Of course, it can be pretty cost effective (with the right SEO and PPC applied) and social media can help to boost the profile of your company further. But is print really dead? Up until quite recently, print was still the most dominant form of advertising. Think about it – how many times have you had to sift through junk mail to get to your bills? 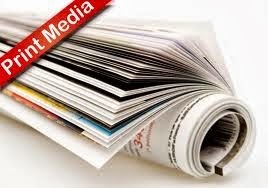 There’s no doubt that for certain businesses, print media is a real asset. Despite the fact that online reading and e-readers, like the Kindle, are popular with the rise of the mobile device, many media experts are adamant that print is here to stay. Editor-in-chief of Grazia magazine, Jane Bruton, believes that no matter how popular online reading and advertising gets, there will always be a demand for that glossy magazine. That said, there’s no doubt that not making the most of online print could be a mistake for any business. Even businesses with a solid footing in print media have begun to make the transition to technology – one such example is Argos. The famous bulky catalogue, the mainstay of many a coffee table, has been replaced by an ‘online version’ – perhaps to lighten the bulky tome and make online shopping more accessible. "Our printed Truck and Plant Locator Weekly Magazine continues to generate great responses for advertisers - if it didn't work, there wouldn't be 128 advertising pages each week packed with trucks and plant for sale. “Truck and Plant Locator Magazine is now in its 17th year and has gone from strength to strength." Let’s face it – it’s all very well to keep everything online, but sometimes being able to hold something as paper has such a novelty to it that the printed medium will never die out. Only time will tell if printed media can keep up with the demand of technology. What’s your money on? Hey Aktar, this is very nice and informative article.